The firm’s product portfolio includes sonar systems, echo sounders, as well as systems for underwater communication and data link units for military and civil application. All products are manufactured and sold at the Kiel facility. As well as furnishing of new built vessels and submarines, Wärtsilä ELAC Nautik specialises in sonar modernisation by customer-specific modification development. Wärtsilä ELAC Nautik further offers installation and service of the products and customer support by training and logistic. Its products and systems are known for their reliability and advanced technique. The company is certified according to DIN EN ISO 9001. Marine vessels are exposed to numerous threats from underwater, for instance mines, divers with transfer vessels and submarines. The frequency of an anti-submarine warfare (ASW) sonar is too low for detection of small objects, whereas the range of a mine hunting sonar is too small. Wärtsilä ELAC Nautik closes this security gap with the compact sonar VANGUARD, combining a forward-looking high-resolution 3D navigation sensor with a system for 360° surveillance, protecting the vessel during its journey as well as while anchoring. VANGUARD is operated by an intuitive graphic interface. Even untrained personnel will be able to operate the system effectively and securely after a very short time. SCOUT is based on the same concept as the VANGUARD sonar family. The main purpose of the sonar is mine avoidance and navigation support in dangerous waters. The high-efficiency of the system is completed by additional features, such as charting of the sea floor and supervision of the surface (for instance shortly before surfacing). SCOUT can also be refitted on existing submarines. Wärtsilä ELAC Nautik offers a wide range of arrays, allowing for installation in all kinds of submarines. Wärtsilä ELAC Nautik’s passive sonar system LOPAS is compact and versatile. The basic version of LOPAS can replace an old sonar, which cannot be maintained any further without considerable costs. In addition LOPAS is the basis for a full sonar suite, including intercept-, active and passive ranging-, mine avoidance- and flank array sonar. For retrofit with LOPAS, Wärtsilä ELAC Nautik uses as much existing components as possible in order to reduce the modification costs. If components such as hydrophones, transducers, baffles or cables must be replaced, Wärtsilä ELAC Nautik offers its own spare parts. Other parts such as pressure hull penetrators can be overhauled. A submarine in distress must be located as fast as possible, to allow a rescue team to save the crew quickly. The pinger location system LOPAS either detects emergency signals, for instance sent by the sonar beacon system, -or performs a long-range active search for a submarine in distress. PILOS is installed on the mother ship. Its compactness and modularity allow installation on virtually any type of vessel, new or overhauled. Apart from the actual rescue mission, PILOS also detects objects, which may for instance have become lost during manoeuvres. If a submarine is in distress and the crew cannot save themselves on their own, it is mandatory to locate the submarine as fast as possible. For this purpose Wärtsilä ELAC Nautik’s sonar beacon system sends an acoustic emergency signal for quick and exact location of the submarine. The system is available as single or dual frequency unit, for either long-range or both short- and long-range. The signal can be released manually or automatically by contact with water and fully complies with STANAG 1298. The portable active / passive diver sonar DSE 1 enables divers to detect mines and other obstacles in coastal waters, rivers or lakes. In contrary to other systems in the market, the DSE 1 fulfills the requirements of STANAG 2897 class 2. The DSE 1 is a multibeam system. Its display provides data about bearing, distance and target size and its passive mode allows detection of sound sources to support recovery of pingers or to assist during rescue operations. 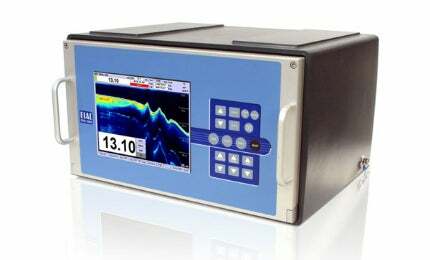 The naval echo sounder VE 5900 is a compact modular system with one to four frequencies for surface vessels or submarines. Control and display elements are combined in a single unit, built to military standards. The system can be installed in a 19in rack or can be delivered as stand-alone unit in a shock-proof housing. Depth data are displayed as echogram and as numerical value on a high-resolution monitor and are stored for a period of at least seven days. The UT 3000 is the first underwater communication system combining analogue and digital communication in one unit. In addition to the telephony and telegraphy mode, the UT 3000 offers unique features such as own noise measurement, horizontal distance measurement and transmission of SOS signals. The new digital mode allows for fast and reliable transmission of digital data in water. Standardized or modified interfaces support the integration into the communication network of the vessel. The system is available for surface vessels and submarines. The UT 2000 is a compact underwater telephone according to military standard. It is in particular installed as an emergency phone in case that the submarine’s electrical system fails. Wärtsilä ELAC Nautik offers approximately 50 different sonar components, including nearly the complete range of outboard sensor technology for submarines such as hydrophones or transducers for active-, passive-, intercept- and flank array sonars, as well as transducers for active sonars onboard of frigates. More than 2000 transducers and hydrophones are produced per year, all of them are tested electrically and acoustically before delivery. All transducers fulfill military or civil standards, such as for instance IMO or Coast Guard requirements, MIL-Specs and DEF-STAN. In addition to the company’s own transducer range, transducers of all kinds can be reproducRedesign and replica of transducersed. Hydroacoustic systems, for which spare parts are no longer available, can thus be kept operational. State-of-the art material and components guarantee highest performance and reliability, supply shortfalls can thus be avoided. The LAZ 5100 is the latest navigation echo sounder, which allows a reliable detection of the sea bottom in shallow as well as in deep water. It fulfills the requirements of IMO for navigation equipment and is type-approved by BSH, USCG and CCS. Wärtsilä ELAC Nautik offers a wide range of single beam and multi beam echo sounders for commercial and scientific survey applications. The multibeam series of Wärtsilä ELAC Nautik cover the complete survey range from shallow to deep water; the company offers the appropriate multibeam system for each application. It has been announced that Wärtsilä Corporation's acquisition of Germany based L-3 Marine Systems International (MSI) has been finalised. L-3 ELAC Nautik has supplied equipment and systems for submarines and surface vessels to more than 40 navies worldwide. We combine decades of experience with innovative solutions in order to develop capable and cost-effective systems. The L'Astrolabe Polar Logistics and Patrol Vessel was built by Chantiers Piriou shipyard in Concarneau, France. Inspector Mk2 mine countermeasures unmanned surface vehicle (USV) variant is based on a multi-purpose drone platform produced by ECA Group. The UK Royal Navy's Type 45 destroyers have replaced the Type 42 destroyers, which were in service since 1978. Six Type 45 destroyers were contracted. The S-70B Seahawk naval helicopter is manufactured by Sikorsky Aircraft in Stratford, Connecticut. Schelde Shipbuilding of the Royal Schelde Company, based in Vlissingen in the Netherlands, has built the Rotterdam Class landing platform dock (LPD) ship. L-3 Elac Nautik now offers a mobile transducer mounting bracket for its SeaBeam 3030 multibeam system with a spatial resolution of 3° x 2°. L-3 Nautronix and L-3 ELAC Nautik announced today the use of their maritime systems equipment to provide unprecedented two-way, reliable communications to the deepest point of the ocean to assist James Cameron's Deepsea Challenger submarine. L-3 ELAC Nautik today announced the appointment of Dr Jörg Brechtefeld as its new general manager. L-3 ELAC Nautik announced today that its mine avoidance sonar was successfully demonstrated as part of the Mine Avoidance Intercept and Analysis (MANTA) system for the WALRUS class submarine of the Royal Netherlands Navy.